Ready to shift your content marketing efforts from differential to exponential? 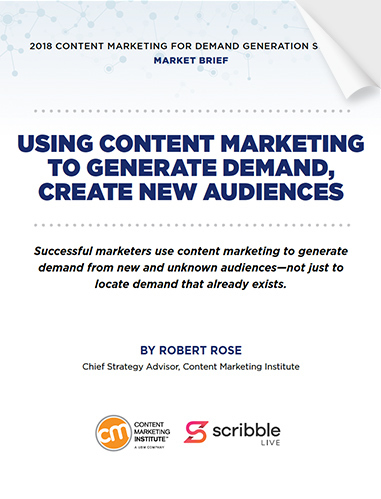 Discover how successful marketers use content marketing to generate demand from new and unknown audiences—new from the Content Marketing Institute..
How are successful marketers using content marketing to generate demand from new and unknown audiences? Ready to shift your content marketing efforts from differential to exponential? 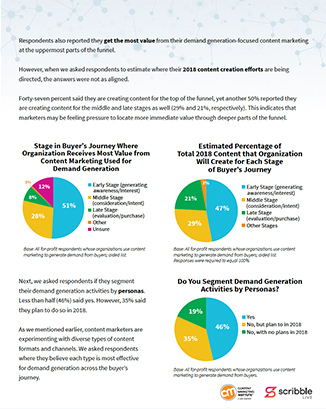 The Content Marketing Institute’s 2018 Content Marketing for Demand Generation Survey examined marketers’ challenges within a competitive (and very loud) marketplace that forces them to consider Demand Generation versus Demand Identification. Robert is the founder and Chief Strategy Advisor of The Content Advisory, the consulting and advisory group of The Content Marketing Institute. 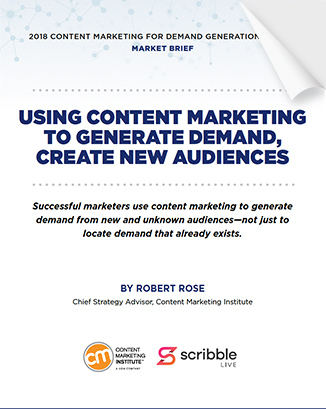 A leading industry expert, Robert also serves as the featured moderator in CMI’s upcoming Demand Generation Summit on October 31st, sponsored by ScribbleLive. How Are Marketers Generating Demand? 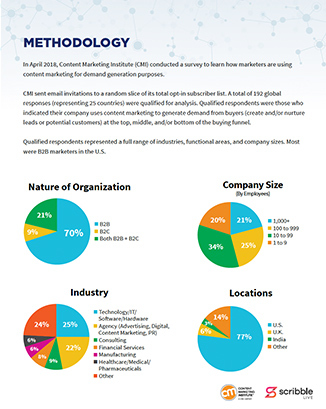 To understand how content marketers are differentiating their approach to demand generation, CMI commissioned its first annual study, the 2018 Content Marketing for Demand Generation Survey: Market Brief. Here are some of the valuable insights and helpful tips you won’t find elsewhere. Which stage of the buyer's journey is each content type most effective when used for Demand Generation? Content marketers continue to focus on demand generation. 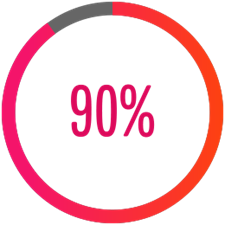 90% of surveyed marketers report using content marketing for demand generation; Nearly all of these marketers use content marketing for demand gen to generate leads at the top of the funnel. Create awareness with a light introduction to your product or service, like an interactive infographic or quiz. Both are great at starting a dialogue with your audience. The goal is to create a fun and engaging experience that brings your brand to life. An infographic or quiz allows audiences to dip their toes in, and while captivating their interest, it also moves them deeper into a consideration phase. Which is a good thing for lead gen and sales goals! Most demand generation-focused content is produced for those in the early stages of the buyer’s journey. 51% receive the most value from content marketing demand gen efforts in the early stage (generating awareness/interest) of the buyer’s journey. Forty-seven percent of respondents indicated that they created the most content for the early stage. Provide value at all stages of the journey by repurposing one piece of content into multiple assets, such as a white paper, infographic, or assessment, each of which appeal to audiences at different stages. We suggest defining your goal in advance, whether it’s lead generation or awareness, before creating a piece that suits that audience’s needs. For example, an infographic might appeal to a buyer in the early stage of the journey, while a white paper or solution finder appeals to the buyer who is closer to making a purchase. 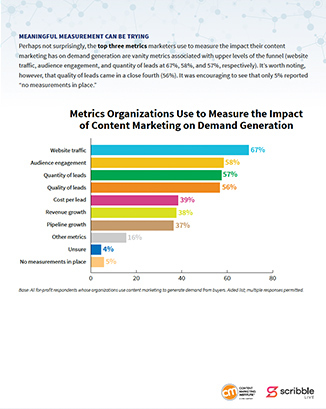 The top 3 metrics used to measure content marketing's impact on demand gen are top-funnel goals. 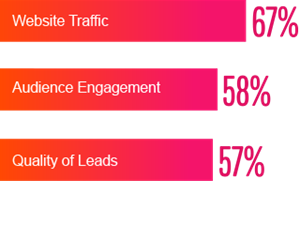 Website traffic is the most frequently measured metric, followed by audience engagement and quantity of leads. Look beyond vanity metrics and toward audience engagement, especially when using interactive content. What elements are users interacting with most frequently? Where are they dropping off? Engagement points are critical for measurement, though drop-off points can be just as illuminating. In an interactive experience, did the user complete the form, download the eBook? Pay close attention to where the typical user has dropped off, and use that information to create an A/B test. Still not sure? Check out CMI's latest for measuring your content performance. If you’re responsible for content marketing your business, you’ll want to closely analyze all of the information in this free 13-page brief and use it to inform your demand generation and audience development strategy. Yes, I would like to receive monthly newsletters, webinar, and promotional notifications. ScribbleLive is an award-winning content performance company that provides global brands with the insights and solutions they need to better attract, convert, and retain their audiences. Companies such as Red Bull, FedEx, Dell, Reuters, Yahoo, American Express, and the Boston Globe leverage the ScribbleLive Content Cloud to create scalable, premium content, interactive experiences, and real-time audience engagement. Our goal is to help you optimize your content performance and drive better business results.